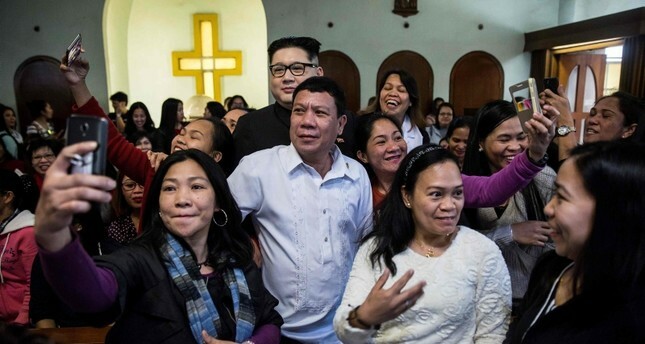 Accompanied by Howard X — the Hong Kong-based impersonator of North Korean leader Kim Jong Un — the Filipino actor arrived at St. Joseph's Church dressed in the Philippine president's signature relaxed white shirt. Hundreds of distracted worshipers erupted into cheers and took photos of the impersonator, who goes by the stage name Cresencio Extreme. As soon as mass ended, worshipers mobbed Cresencio Extreme, many screaming and taking photos with their mobile phones as he waved at them and shook their hands. "Coming in here to make a scene — our Duterte is not like that," she told French Press Agency (AFP).